Two things make Agriturismo del Sole very special: Number one is the hillside location on the more quaint Anacapri side of the Island of Capri, Campania, which results in some magnificent views over the island, the sea and towards the island of Ischia to the north. Number two is the food; the owners are enthusiastic cooks and you will be spoiled with some fantastic, fresh and homemade, Italian food. Their evening meals particularly are worthy of any of the top restaurants in Capri but with the added pleasure of enjoying them alongside stunning views and a much more informal, homely, atmosphere. There is a choice of double rooms on offer; all of which are traditional Italian farmhouse style. One of them is a particular favourite with guests; the superior double room which has two balconies and incredible views, though to compensate, some of the others have private patios and the tremendous views are never far away. Agriturismo del Sole is a very much unassuming place that feels more family home than hotel, but you’ll have hotel perks; air-con, mini fridge, satellite TV and WiFi for example. All the rooms are B&B and the breakfast is super, with lots of sweet and savory bits and pieces including some very good jams made with fruit from the trees outside. The grow fruits and vegetables in the gardens as well a range of herbs, all of which go into food for themselves and their guests, and, as mentioned before the evening meals are especially good. 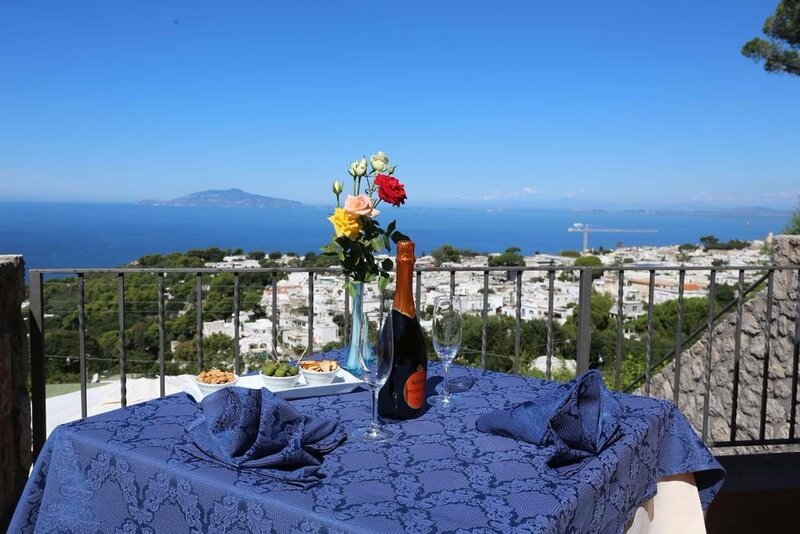 Near Naples, on the famously beautiful isle of Capri, Agriturismo del Sole is on the quieter, quainter, more traditional, half of the island known as Anacapri, a place quite different in character from the more glitzy ‘main’ Capri side. In fact for anyone put off by the crowds on Capri, Anacapri can offer some respite despite being only ten or fifteen minutes away by bus or car. The agriturismo can offer more respite again, being about 800m away from the main square of Anacapri, and the walk up and down takes you along some typically beautiful, winding, narrow lanes. On the way there though if you just let the owners know of your arrival time they can generally come pick you up or arrange transfers from there or other parts of the island, ferry port, etc.